The Blues are still confident of signing the England international after missing out on Dani Alves. Tottenham's Kyle Walker is wanted by Man City. TOTTENHAM HAVE TOLD Manchester City to cough up £50 million (€56m) for Kyle Walker, according to British media reports. City have been pursuing Walker for months and remain confident of bringing him to the club before the end of the transfer window, but have made several pushes to finalise a deal already this summer and have so far come up short. The Blues had been banking on signing Dani Alves as competition for Walker but the Brazilian made a shock u-turn after agreeing terms with the Premier League club and was announced as a Paris Saint-Germain player on Wednesday afternoon. That blow is unlikely to do City any favours in their pursuit of Walker, though they have already agreed personal terms with the England international. While it is understood that Spurs chairman Daniel Levy is happy to sell the England full-back eventually, he has proven a predictably tough negotiator so far and is holding out for £50m. City had been hoping to strike a deal at under £45m but may now have to bite the bullet and meet Spurs’ demands, so as not to miss out on a second right-back target. 20-year-old Pablo Maffeo is currently the only recognised right-back at City as the club prepare to fly to the United States for pre-season training on Monday. As recently as Tuesday afternoon they had been expecting Alves to join them on their flight to Houston, only to see him pitch up in Paris and undergo a medical. At his unveiling on Wednesday, he apologised to City for having gone back on his verbal agreement to move to the Etihad Stadium. “If Pep Guardiola and Manchester City feel hurt, I am sorry… I’ve come here to be a champion,” he said. Email “Spurs set Kyle Walker asking price at €56 million - reports”. 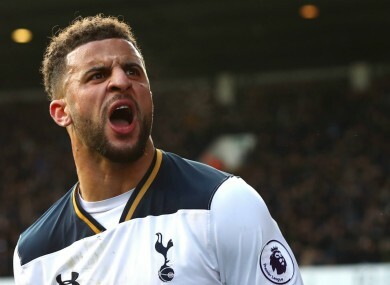 Feedback on “Spurs set Kyle Walker asking price at €56 million - reports”.